After GW6 was over, I headed back to my truck to take a breather before the geocoin swap meet and was emptying my backpack when I came across this beautiful coin. I don't remember trading for it because I looked at all the coins people gave me as we traded them, so I think someone snuck this into my backpack when I was busy talking someone's ear off or laid it down, lol. I wasn't sure about the coin so I called up TMA to ask (the coin man himself ) and he hadn't seen or heard of it either. At the geocoin swap meet, i showed a few people and no one else knew anything about it either. So whoever the mystery coin giver is, thanks so much for a beautiful coin with a beautiful message, that was very generous and made my day and I had an awesome one at that. That is a very lovely coin, in many ways that is. Maybe we all should Imagine a little bit more. Imagine as in believe, visualize and have some faith in many things. I do know that I´m a believer, in many things, and I do believe in the message of this coin. Many congrats to you Tsun for beeing the first (as I know) to get one of these beauties. Absolutely beautiful coin, love the opal-like look of the dove and how it sparkles, congratulations on this latest addition to your collection........and well done to the mystery giver for such a lovely gesture. OHHHHH VERY PRETTY!! Congratz on getting this coins TSun, you are a very deserving person! A gorgeous coin with a great message. Congrats Tsun and cheers to yet another mystery coin!! I was fortunate enough to get to see the coin. What a beautiful coin with a beautiful message! Congrats Tsun!! How cool is that!!! A mystery coin that also has a Beatles message? After the day my roommate and caching partner had (she was rear ended on the way home from work) this would be an absolute perfect coin for a cheer me up. She is a huge Beatles fan. Congrats Steph on an awesome addition!!! Congrats TSUN. That is a great coin with a great message. OHH, Steph! What a beautiful coin and what a beautiful, deserving person to receive it! Hello Le mita cola Tsun!!!! Congratulations Tsun!!! A great coin for a great person!!! for being the person you are! Ok, I killed the song! Gorgeous design! Congratulation and glad to hear you had a great time. Yea those coins are really nice. I was hiking in the Red River Gorge yesterday and found one in a rock shelter. These mystery coins sure can bring a smile to your face. Congratulations on receiving such a beautiful mystery coin! WOW! Congrats TSun, what a great coin to get at a even better event. how wonderful for those blessed with peace. I just pray that everyone would live by that simple message. Amazing how much emotion something as simple as a coin can invoke. C0NGRATULATIONS Cav Scout & TSun. This is a very lovely coin. I'm glad you both got one. Enjoy them. That is one great looking coin!!! Another MYSTERY COIN...WOW!! Congrats to you Cav Scout for finding one in the wild...and to Tsun! Imagine a coin bringing smiles and happiness to all the cachers, no it isn't a dream, it's the reality of a MYSTERY coiner spreading peace throughout the community! Congratulations on finding those lovely peace coins! What a great message indeed and at a such an appropriate time. I took Bella to our little hometown Memorial Day parade yesterday, and was shocked to find myself shedding tears as all the vets passed me by. Something I've never given much thought about before suddenly had a HUGE impact on me. Congrats tsun on your coin and Cav Scout too! That is a very beautiful coin and message. OMG, there really are almost no words that I can use to descibe how I feel about this coin. Congrats Tsun! It couldn't happen to a better person! 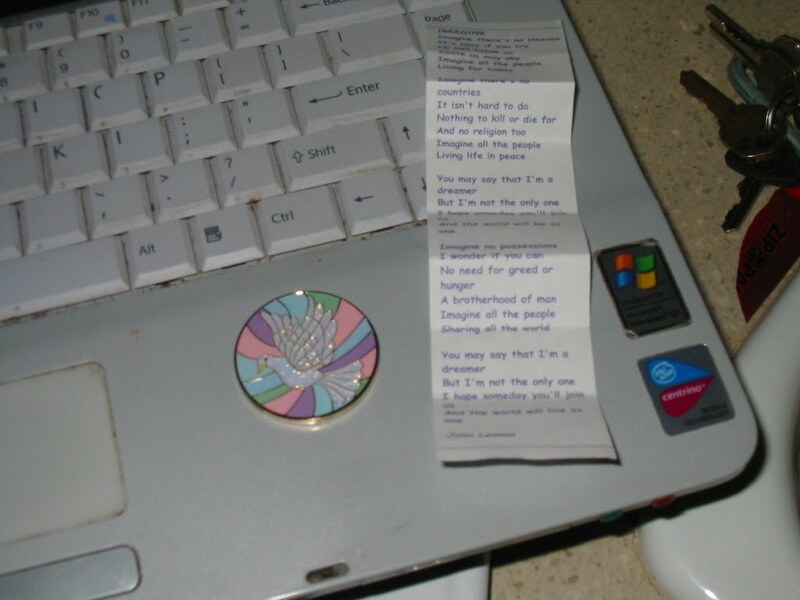 Wow, another mystery geocoin. I'm amazed at the generosity of all of you mystery geocoin givers. What a great geocoin family. I was already pretty bummed that I couldn't go to GW6 this year. The cost of flying out there plus the fact that my daughters had their dance recitals yesterday prohibited me from going. Hearing all the great stories from those that went, seeing the pictures, and learning about all the new mystery geocoins revealed at GW6 makes me even more jealous that I couldn't go. But, my daughters did awesome at the recital and I wouldn't have missed that for the world! Congrats on the new coins! And thanks tsun for braving crossing the crowd at the coin event so fairyhoney and I could check the coin out, it was very nice. Cool, neat coin. There used to be a cache named IMAGINE at Strawberry Fields in New York. What a beautiful coin inside and out! Congrats finders! Great coin. Congratz Tsun and Cav Scout. This is one of my all-time favourite songs! Love the message. And that coin is sure spectacular! Congrats to those who have received them. OMG WOW What a beautiful coin I like mystery coins... but this one is really WOW! WOW ! Congrads on all the people who have received this new beautiful Mystery Geocoin. It still amazes us on how many generious people who are out here that give free coins away by the generousity. How any more special can that get??? Bless each and every one of you who gets mystery coins and ones that make them and send them out in caches or in the mail, give yourself a pat on the back for making people's days more brighter. I guess I don't know enough people! But I had a good time at the "Stock" and it was neat to meet a lot of the people who I have seen in these forums! Congrats on finding the coins! Congratulations tsun and Cav Scout. Another Mystery Coin!! Wow - they've all come out of the woodwork for GW6!! WOW!! How BEAUTIFUL!! That is an amazing Mystery Coin! Congrats to you both!! Wow, so many mystery coins out and about lately.... Congrate TSUN! This is another beautiful coin! I'm sorry that I didn't get a chance to meet you at GW6... maybe next time! Beautiful coin! Congrats to Tsun & Cav Scout I hope to see more mystery coins pop up around here. Nothing makes the day brighter than a pleasant suprise! Great coin, and a fun story - congrats! My son, Mr.Moo, kept his backback half open during GW6, just hoping that a mystery coin would fall into it. No such luck, but he actually enjoyed being bumped into in the crowded areas, just in case! I got to see and fondle myself . . .
Love the song - the message behind it And the coin. It was awesome to see.